General Manager of Food and Beverage for The Annex Hotel, Brooke De Nobile, brings her family's celery caesar recipe to life at The Annex Lobby Bar. In a food processor place dijon, lemon juice, garlic, Parmigiano and anchovies – close the lid and pulse until they start to emulsify. Then, turn on high while drizzling olive oil in slowly to incorporate. Leave on high until completely smooth. Set aside. Clean the little gem and/or baby romaine heart gently with lukewarm water keeping it intact. Rest in a loosely wrapped paper towel. In a bowl mix the diced celery with dressing (meant to be overdressed) and stir until smothered. Carefully trim off the base of baby romaine, allowing it to stand upright. Then take the overdressed celery and surround the romaine heart, pouring the last bit of the mixture on top of the romaine heart. 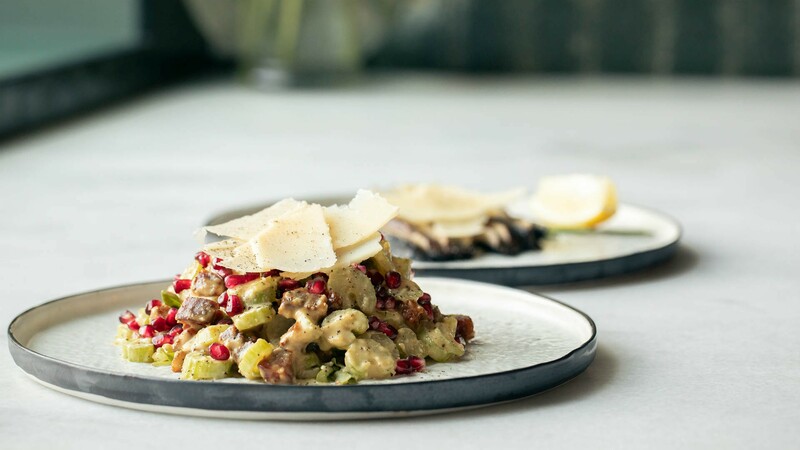 Garnish with cooked crispy pancetta on top (crumble for texture if desired) then place pomegranates all over the salad to replace croutons and add colour. For the final touch, place big shavings of Parmigiano Reggiano on top of the romaine heart. A vegetable peeler (or cheese grater) can be used to create shavings from a block of whole Parmigiano Reggiano.